Anna Meares waves to the crowd at the 2008 Beijing Olympics. RARE is the sporting great who did not have family support behind them, but the home crew who propelled Anna Meares to Olympic fame is something else again. 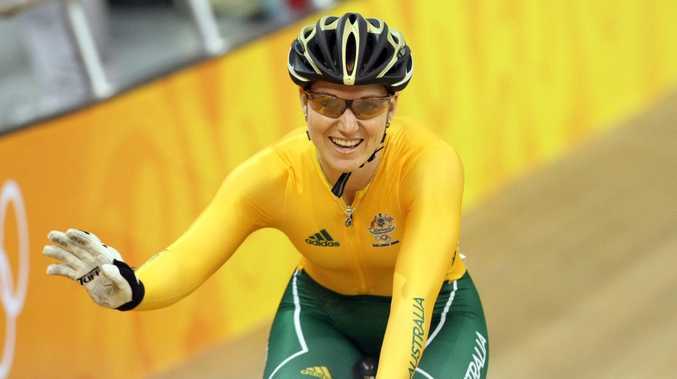 Meares, a dual Olympic gold medallist, will be inducted into the Queensland Sport Hall of Fame at the November 28 dinner at the Brisbane Convention and Exhibition Centre. Meares' sister Kerrie Rosemond won two gold medals at the 2002 Commonwealth Games and a silver in the sprint at that year's world championships. The first of Meares' 11 world titles gold medals, seized during a remarkable span of success from 2004-15, came two years later. But for both coalminer's daughters, a life on two wheels started when they followed their brother Scott to BMX competitions far and wide from the home in Middlemount. 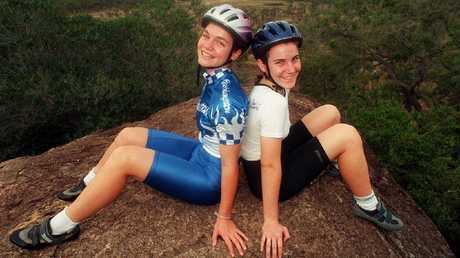 "Mum's rule was she wouldn't take four kids to four different sports,'' Meares said. Scott Meares took up karate, at which both his two younger sisters achieved a brown belt. By the time he moved out of home, an 11-year-old Anna and Kerrie, 12, had been inspired by Kathy Watt on television in the track cycling at a Commonwealth Games. "We asked our parents about track cycling - the closest cycling facility was in Mackay,'' said Anna, who appreciates mother Marilyn driving them thousands of kilometres on the 240km trek there and back to Middlemount. 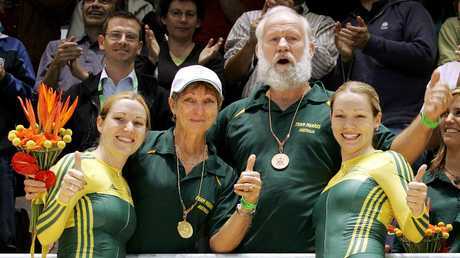 Anna and Kerrie Meares celebrate victory with mum Marilyn and dad Anthony at the Melbourne Commonwealth Games in 2006. Meares counts older sister Tracey and brother Scott among her best supporters. "When we were kids, they said to our parents, 'Put the money towards Kerrie and Anna's sport','' she said. Meares's parents Marilyn and Anthony, older sister Tracey Brown, her husband Richard and daughters Piper and Brooklyn and sister-in-law Danielle will be at the Hall of Fame induction in Brisbane. Sister Kerrie will be elsewhere in Brisbane that night, celebrating her wedding anniversary with her wife Emily Rosemond. "I said to her, 'That's your life. Celebrate your anniversary','' Anna said. "Kerrie has been an incredible role model. She was very protective of me in the early part of my career and guided me. She taught me a lot of things, including the transition to retirement. 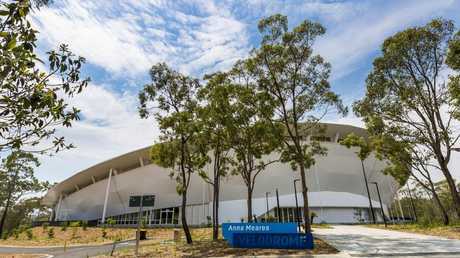 The Anna Meares Velodrome at Chandler. Meares is perhaps renowned most for her determination in winning a sprint silver medal at the 2008 Beijing Olympic seven months after breaking her neck in a track fall and her 2012 London Games gold to have the last word in a rivalry with England's Victoria Pendleton. "It (2012) was a crescendo moment for me. I'd put my silver from Beijing in 2008 up there as well, given the circumstances,'' said Meares, who also won five Commonwealth Games golds. Asked if she had pushed the envelope by competing bravely under such duress at the 2008 Olympics, Meares said the time frame was "within reason'' but she had willingly paid a physical price. 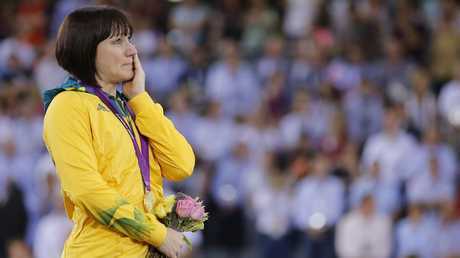 Anna Meares shows her emotion during the medal presentation at the London Olympics in 2012. "I wasn't able to turn my head properly for 18 months. I still to this day have a lot of issues to do with migranes and (neck) pain,'' she said. "It wasn't that cycling meant that much to me, although I did love it, it was that I got a chance to represent Australia at an Olympic Games. I had to ask myself if what I put myself through and what I am currently going through was worth it. "But those moments are rare. I had an extensive career and I went to four Olympics, so even though it was more than most I experienced that four times only in my lifetime. The first of the year's four Hall of Fame inductees to be revealed was former Lions captain Jonathan Brown.